Several years ago when I moved from Bisbee to McNeal, 18 miles away, and the altitude dropped a 1000 feet, I realized I could start growing cotton in my little vegetable garden. So three years ago I planted some green, brown and Pima cotton seeds. Two nice green cotton plants came up and two Pima plants, but no brown. After taking the seeds out of all the cotton, I decided not to grow it last year but unbeknown to me some seeds reseeded and I ended up with a couple nice cotton plants and I did not have the heart to pull them out. They turned out to be green cotton plants. Last fall and winter I spent many hours taking the seeds from the beautiful green fiber and spent leisure hours spinning it on my takli spindle and on the spinning wheel. Since I spin finer on my takli, I used that thread to ply to make my warp. Keeping the green spun yarn in a brown bag to keep it away from the light, which will fade it to a light brown if exposed to long, I did not realize actually how much a really had. So this summer I dug into the bag and discovered more then enough spun green yarn to make myself a nice cool blouse. So let’s look at a few facts that went into creating this blouse. First off it took about 120 days for the cotton plant to grow, bloom, and create a pod where the seeds began to sprout the fiber. When the pod or boll could no longer contain all the cotton fiber, it burst open and the fiber grew light and fluffy under the Arizona sun. After picking this cotton it is necessary to take the seeds from the fiber and I found this hard, labor intensive work and pretty rough on the fingers. It took me close to 8 hours to end up with 4 oz of fiber and I had about 10 oz of seeds. Each boll of cotton had between 30 and 45 seeds and each plant produced 25 to 30 bolls of cotton. So that means from one seed the plant grew and produced over a 1000 new seeds!! With all the nice fluffy cotton one can spin it without carding but it will be quite textured. I knew I wanted a smooth yarn for either clothing or tea towels, so I carded it, made punis and then spun the green fiber. Some I plied and skeined while the singles I always wound on a ball winder with a paper core, running it through a yardage counter first. I labeled the yardage on all my spun yarns. To me this was the easy part and now I needed to decide what I was going to make and what patterns I wanted to use. Since I am mainly a weaver it meant I needed to determine the sett, yardage needed, and the weave structure. Living in southern Arizona I knew I wanted a nice cool blouse. Then I had to determined the pattern and yardage needed. Plain weave was fine to show off the beautiful yarn but I wanted a design structure at the yoke. Going to my new Handweaver’s Pattern Directory by Anne Dixon I picked out a Spot Bronson pattern. Since I wear a size 10 shirt, I realized I only had to make 2 yards, 25 ½ inches wide. Having a Baby Wolf loom, you need to stay a small size!! 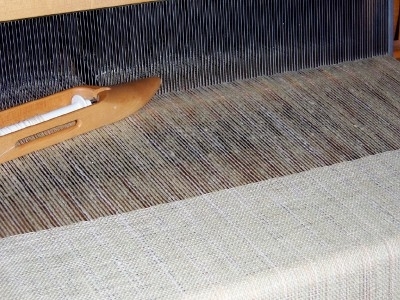 See the photo of the material being woven on my loom and note how light a green it is. The sett I determined was 16 epi and I wanted a faint stripe so used a strand of white and green plied yarn, one strand of white plied with a green. Picking the Spot Bronson pattern meant I had to spend over an hour changing around my heddles on the loom since harness one needed one half of all the heddles used. Threading and weaving was easy and I had the fabric woven off within a couple days. It is always exciting to wash natural colored cotton for the first time. You are never sure exactly what the final color will be. You can see the difference in the second photo where I have washed the fabric and rinsed it with a little ammonia in the water. The ammonia changes the ph and will darken the natural color to a darken shade. 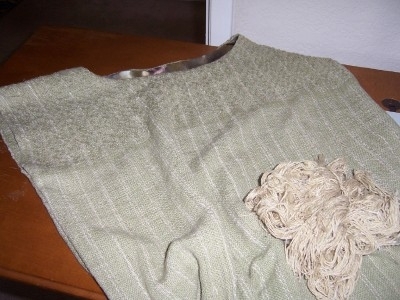 Note the original threads (thrums) laying on the blouse, they were not washed and are a light brownish green. Sewing is not my forte so I keep it simple. Sew on a neck facing, cut out the center, and zip up the sides to the armhole. I crocheted a couple rows around the sleeve with some plied green handspun and hemmed the bottom. This year I planted some Peruvian brown cotton seeds and you can watch them growing on my web site. Hopefully they are what I planned and next year I will have a brown top to wear during the summer.